I have the most amazing client I absolutely love working with and I was in Utah visiting with them and as a surprise the wonderful gentleman driving me between campuses took a detour off the highway and brought me to the Amano shop. For that kindness I could never express in words how grateful I was and am. While I was at the factory shop regrettably Art was not around and I think ironically had only just stepped out. I had tried, in vain, to purchase some cocoa dusted truffle balls made with Dos Rios. The poor clerk thought I was stark raving bonkers until I finally admitted that I had loved them at a judging session and asked after them so knew that they were the work of Amano – perhaps simply for judging. While I was in the shop I decided to try the Chuao again. I understand about things like over roasted beans and while others may not be aware of why a chocolate tastes the way it does, I do know the flavour of an over roasted bean. 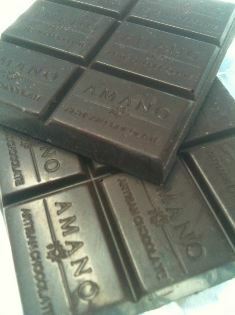 I was offered a replacement by Amano but disclosed that I had bought another bar anyway to give them a second chance. Anyway – the Chuao. Clearly they are not going to have captured those bright red berries and jazzy acidity – or would they? Could this bar be the one that finally exposes those gorgeous flavours? With tasting notes of plums, blueberries and blackberries I was hopeful – then I read on to the molasses, coffee and almonds. Oh dear. There is the briefest hint of red fruit I get just at the start with a clean nose but the coffee soon comes through with the darker notes. Definitely molasses, absolutely coffee, a nose of a light roast I’d say 😉 along with a definite unroasted almond flavour and purple berries are for sure there. Not sure about blueberry but I am clear on the plums at the very end and the blackberries earlier on and throughout in hints here and there. There is a slightly powdery mouth feel as the chocolate melts – more than JP Hevin, Aria bar, less than Willie’s Delectable Cacao. The finish is strangely slightly tart with berry notes and not the coffee I would have expected. This bar really changes in the mouth and while not quite the bright notes of red fruits and my beloved acidity, it certainly is complex and changing with a really unique finish. Since I know a lot of people like their chocolate on the darker side (so to speak) with notes of coffee and spices and unroasted nuts, this is going to be a winner for the additional complexity it brings to a darker lovers bar. While perhaps not my favourite, it is, nonetheless, a great chocolate bar. I don’t think this is a very strong bar for Amano, in my opinion. 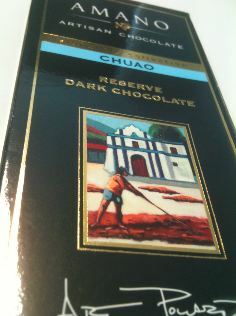 I like their others better… and I think other chocolate makers do a better job of chuao.